The perfect fleet? – HubNut – celebrating the average! Three years ago, I thought I’d amassed the perfect fleet. Not a bad line-up is it? 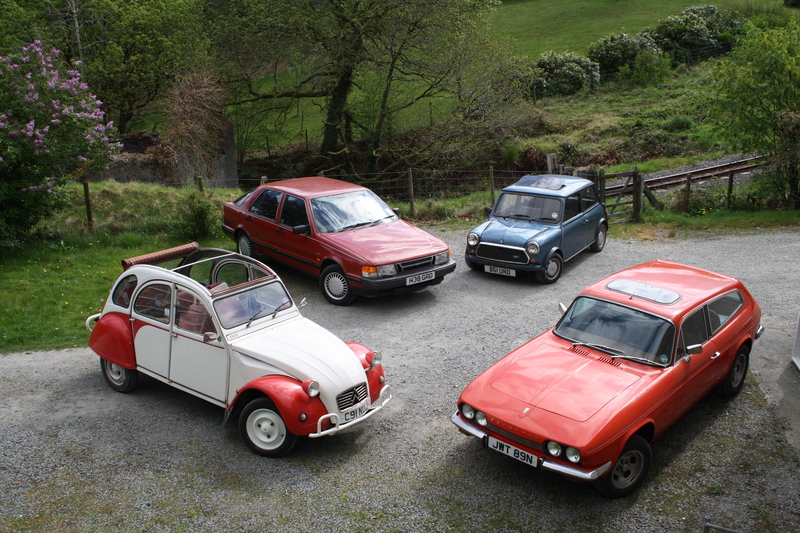 There’s a 2CV, because every perfect fleet should have a 2CV on it. There’s a wonderfully capable, modern-ish barge in the form of a Saab 9000i 2.3. 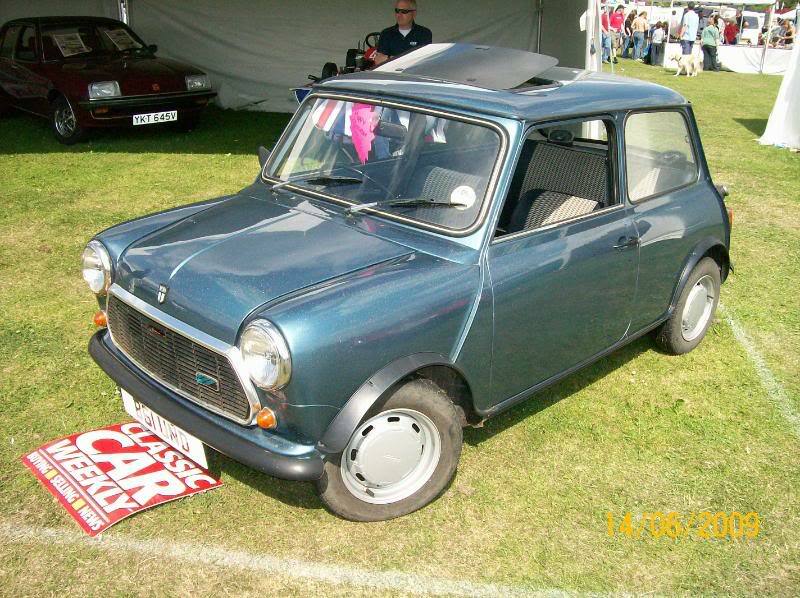 There’s a Mini, because my wife reckons anything bigger than a Mini is unnecessarily large. And there’s a nice, shiny, proper chrome-bumpered classic in the form of a Ford V6-powered Reliant Scimitar. Only one of those cars remains though, and even she has been causing me some serious head-scratching. Doesn’t she look lovely there? Barely a hint of rust. Those were the days! This was taken in April 2011, and it was sunny. We’d been living our ‘perfect’ life for six months and following the same of the Austin Westminster, and profit on the Land Rover 90 V8, I could really treat myself. I’d wanted a Scimitar since I was a child. Mind you, I’d wanted a Land Rover V8 since I was a child too, and I hadn’t enjoyed it that much! The same would sadly be true of the Scimitar as well. They are far better than their values and reputation suggest, but there was no way I was going to enjoy a car that was quite so firm of ride. So, it wasn’t perfect. It had to go. Then the Saab came under scrutiny. I liked a lot of things about it. I liked that it was one owner from new. I liked that it had full main dealer service history throughout its 124,000 miles. I liked its 150bhp and bountiful torque. Comfort was first rate too, and it had fabulous headlamp wipers. It was the first car I’d owned where they both worked. The boot was enormous, the on-board computer uncannily accurate and recording MPG (34 on a run quite easily). Inevitably, it was a bit too dull, and the soggy steering annoyed me. It had to go. The Mini was rather more difficult. We bought it for the grand sum of £741 on Ebay in 2005, sight-unseen. Bravery paid off and little Betsy soon found herself commuting to Banbury or Oxford from our Northants base on a daily basis. She was treated to a full restoration in 2008 and moved house with us twice. As with the 2CV though, it didn’t take long for corrosion to return. She was barely getting driven too, because frankly I’d rather drive pretty much anything else. She had to go. Yet I look back on the opening image with great fondness. There is not a hint of regret with any of those purchases. The truth is that the perfect fleet just doesn’t exist. I’m pretty sure the perfect car doesn’t exist. If it does, I haven’t found it yet. Much as I love 2CVs, they fail to capture my interest sufficiently to stop me buying anything else!